"To ensure that all persons in the County have affordable accommodation suitable to their social and personal needs"
The Council, in seeking to achieve this objective, and in line with the policies set down in the Policy Document "Delivering Homes - Sustaining Communities" published by the Department of the Environment in 2007, continues to provide a wide range of housing services throughout the County. To promote and utilise the options provided for in National Housing Policy. To implement our Social Housing Investment Programme. To prepare and implement a programme for advance land acquisition in accordance with National Housing Policy. To ensure that our housing policy encourages and supports Rural Sustainability. To implement the 5 year Traveller Accommodation Plan 2014 - 2018. To implement the provisions of the Homeless Strategies and Action Plans. To promote, assist and develop the Voluntary Housing Sector in the County. To prioritise Social Inclusion by promoting resident participation in the management of social housing schemes. To comply with Private Sector Residential Accommodation Legislation/Regulations. To upgrade our Housing Stock subject to the availability of funding both nationally and locally. I am a property owner interested in the new scheme, what should I do? Can I sell the property during the term? Under the long term leasing arrangement the property can be sold by the property owner during the term, on the condition that the lease agreement is transferred to the new owner and the local authority or AHB is notified in advance. What is the main benefit for property owners? If a property requires repairs to bring it up to standard for letting, a local authority or approved housing body (AHB) will pay for this repair work up-front in return for the property being made available for social housing through a lease for a period of at least 10 years. Under the long term leasing arrangements the property will be returned to the property owner at the end of the term in good repair order and condition, save for fair wear and tear. The local authority or AHB will be responsible for internal maintenance and repairs during the term of the lease. When entering into a leasing agreement, property owners accept that, at the end of the lease term, furnishings and appliances may not be returned. Any furniture and appliances that are left in the property will revert to the ownership of the property owner and are not subject to the requirement to have them in the same condition as at the outset of the lease, subject to fair wear and tear. If the property meets these requirements it will be inspected by local authority or AHB staff who will identify the works that are required to bring the house up to the required standard. the scope and cost of the works required to meet the standards, and the recoupment of the works cost through the lease payments, will be agreed between the owner and the local authority/AHB. When will the scheme be available nationally? The scheme was initially piloted in Carlow County Council and Waterford City and County Council from 6 October 2016. This pilot is now being extended to all local authorities. The Department will be working with local authorities, from today (23 February 2017) and over the coming weeks to assist with preparations for the implementation of the new scheme locally. If property owners are interested in the scheme they should contact their local authority for more information. What is the minimum standard required? Properties must be in good structural condition and will be subject to inspection by the local authority or the AHB. hhhhBER certificates will be required for all properties. Minimum BER criteria may apply in some local authority areas. Property owners will also be required to prove ownership of the house and tax compliance. It will be the responsibility of the owner to ensure that they consult with their finance/mortgage provider and get consent to enter into a leasing arrangement, if required. How much money has been allocated to the scheme? As part of the implementation of Rebuilding Ireland, €140m million has been allocated towards the cost of funding the necessary repairs to properties out to 2021. €32m has been made available for 2017 with a target of 800 properties. What will the role of Approved Housing Bodies (AHBs) be? AHBs will be working with local authorities and property owners to identifyproperties and to bring the properties up to the required standard. AHBs may sign lease arrangements with property owners, on behalf of, and with the agreement of local authorities. These properties will then be managed by the AHBs on behalf of the local authorities. The tenants who will occupy these properties will be social housing tenants. How many properties are expected to become available for social housing under the scheme? The Repair and Leasing Scheme is a key action under Pillar 5 (Utilise Existing Housing) of Rebuilding Ireland, which will have a significant impact on our accelerated delivery of social housing. Over the course of the next five years, 3,500 properties are targeted to be brought into social housing use under the scheme. The profile for 2017 has been increased from 150 to 800 units. Who will inspect the property? If the property is deemed to be suitable for social housing and in an area where there is demand for social housing, the local authority or AHB will arrange for a site visit of the property to determine the condition of the property and asses the level of repairs that may be required to bring the property to the required standard. At the end of the site visit, the local authority or AHB will provide the property owners with a checklist list based on the Standards for Rented Houses (see No. 4 above). the property has to be assessed as being viable to provide social housing. a further adjustment to the lease payment to off-set the cost of the repair/upgrade work until the cost of the work has been repaid. The scope and cost of the works required to meet the Standards, and the recoupment of the works cost through the lease payments, will be agreed between the owner and the local authority/ AHB. Will the property owner have to arrange a contractor to complete the work? If the property owner wishes to make the property available under a lease arrangement with a local authority or AHB, then both parties sign an Agreement to Lease. This signals the property owner’s agreement to the length of the lease arrangement, the market rent of the property and a schedule of the works required. There are two options for the completion of the necessary works. Following the initial site visit by the local authority or AHB, the property owner will be responsible for the preparation of a schedule of works and must then arrange for a quote for the works and this must be agreed with the local authority/AHB before work begins. The works of repair and refurbishment are to be carried out by an approved contractor who is fully tax compliant and has furnished all necessary evidence of same to the local authority or AHB as required. On completion of the works, the property owner should arrange for an invoice from the contractor and present this to the local authority/AHB. The local authority/AHB will arrange for a site visit to the property and if all works have been carried out to the standard required, the local authority/AHB will provide the property owner with the agreed amount to settle the invoice. Proof of payment to the contractor must be provided to the local authority/AHB within 10 working days. For property owners who may not be in a position to engage a contractor, the repair works may be carried out by, or on behalf of, the local authority/AHB. In advance of the works commencing the property owner will be required to complete a Homeowners Agreement and License which gives authority to the local authority/AHB to conduct works on the property. Is the scheme available nationally? Is there a maximum value of works allowed under the scheme? The purpose of the initiative is to restore suitable properties to the required standard for long-term leasing as outlined in No. 4 above. The local authority or AHB will agree with a property owner the specific works and associated costs on a case by case basis having regard to the condition of the property. Not all properties will require significant works to bring them up to standard. However it is recognised that others, especially those that may have been vacant for a longer period, may require more extensive repair. The maximum costs of repairs allowable under the initiative will be €40,000. As the property owner is paying for these repairs through an offset against rental income, it is in the interests of the property owner that repair costs are not excessive. Is the property required to be furnished? All properties that are leased under the Social Housing Current Expenditure Programme (SHCEP) must be furnished and include certain appliances. Market rent is typically agreed on the basis of a furnished property. The furnishings and appliances provided within a property are a factor in agreeing the market rent level. The cost of providing the necessary furniture may be included in the ceiling cost of €40,000 subject to agreement with the local authority on what furniture is required, appropriate costs and evidence of purchase receipts. In some cases where works are being carried out by a contractor it may be possible to request a "furniture pack” as part of the contract. All rooms or parts of the property must have an appropriate floor covering. All windows should have appropriate window coverings e.g. blinds and/or curtains. Each bathroom/en-suite should include a bathroom cabinet and the shower unit should have an adequate shower screen. Floor coverings should be water resistant. Each bedroom should include an appropriate sized bed for that room. Each bed should include a minimum of a bed base and a mattress. One wardrobe (integrated or free standing) per room should be provided as a minimum. The dining area should have a table and an adequate number of chairs to suit the expected occupancy level. The living area should include a minimum of a suite of furniture appropriate to the room size.  Cooker hood or an extractor fan. What can the property owner expect to receive in rent? Rents will be agreed through negotiation with the LA/AHB. The maximum rent to be agreed under the terms of social leasing will be 80% (85% in the case of apartments) of the current market rent. Rent reviews will usually take place every three or four years. The cost of the repairs shall be offset against the agreed rental payment until the value of the works is repaid. The LA/AHB will agree with the property owner on a case by case basis what the appropriate offset period will be. These arrangements may include scenarios whereby the offset is by way of a rent-free period; a consistent reduction over the duration of the lease or a term which is scaled against the duration of the lease as in the table below. What is the minimum length of a lease? The minimum length of the lease is ten years. Depending on the value of the repairs, the local authority/AHB may require the lease period to be up to 20 years. This will ensure that the value of the repairs is repaid in a gradual fashion. See table below. How is the cost of the repairs repaid? The local authority/AHB will agree with the property owner on a case by case basis what the appropriate offset period will be. These arrangements may include scenarios whereby the offset is by way of a rent-free period; a consistent reduction over the duration of the lease or a term which is scaled against the duration of the lease as in the table below. The local authority/AHB will agree with the property owner on a case by case basis what the appropriate offset period will be. Who will be responsible for maintaining the property? The owner will retain responsibility for structural insurance, structural maintenance and structural repair. The owner will retain responsibility for the payment of the management of company service charge (usually apartments only), and any other charges for which the property owner is liable e.g. Local Property Tax and Non-Principal Private Residence charge. The local authority or AHB will manage and provide support to its tenants. The local authority or AHB will maintain the property internally for the term of the lease. Properties will be returned to the property owner in good condition at the end of the lease term, subject to normal wear and tear. In some instances the property owner may agree with the local authority to include an ‘option to purchase’ as a condition of the lease. This gives the local authority the option to buy the property during the term of the lease. Both parties must be in agreement to include this condition and the specific terms can be negotiated. It will be the responsibility of the property owner to ensure they consult with their finance provider and to get consent to enter a leasing arrangement, if required. Will the property owner be the landlord? No. The properties acquired under this arrangement will be offered by the local authority or the AHB as accommodation to households who have been approved by the local authority for housing. Tenants will sign a tenancy agreement with the local authority or the AHB. These houses will not be available to private tenants. Will these units be available to HAP and RAS tenants? No. While these properties will be offered by the local authority or the AHB as accommodation to households who have been approved by the local authority for housing, tenants will sign a tenancy agreement with the local authority or the AHB. These houses will not be available to private tenants. What if I want my property back before the end of the lease term? Under the long term lease arrangement, the lease term will be for a minimum of 10 years. In all cases a clawback clause will be included in the lease agreement if the property is withdrawn or becomes unavailable before the end of the offset period of the lease. This is to ensure the value of the works already paid for by the local authority/AHB is fully repaid. Members of the Housing, Community & Cultural Strategic Policy Committee along with Council Officials. Minister Eoghan Murphy turned the sod at the site of 26 new social houses in Glenconnor, Clonmel. #HousingFocus is a national awareness campaign commencing the week beginning 1st October. Are you aware of a #VacantHome in County Tipperary? 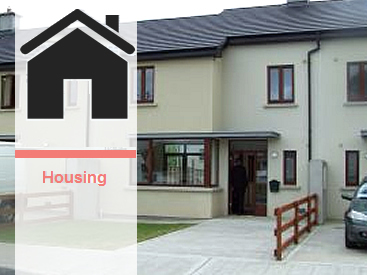 The new merged Housing Allocation Scheme was adopted by Tipperary County Council on the 13th April 2015. Local Authority Rents can be paid online by credit or laser card. A PIN access code is required along with your account number. The same PIN code will work for Rents and Loan and Water payments. Balances are updated on a nightly basis. Please note: Online payments are unavailable on a nightly basis from midnight each night for 30 mins. This is to facilitate processing. Local Authority Loans can be paid online by credit or laser card. A PIN access code is required along with your account number. The same PIN code will work for Rents and Loan payments. Balances are updated on a nightly basis.